Coconut probably is one of my favorite ingredients. When I found out that South Indian cuisine had a lot of coconut in it, I went on a quest to find someone from South India who could give me some recipes. I was successful in finding two. Unfortunately, one of them doesn’t cook with coconut much, and the other one was vegetarian. But never fear, my quest continues. I’m hearing batman music right now, that’s probably just in my head. But until then, there’s always pie. Ummm….pie. Pie should be its own food group. And since I’m not likely to be leaping any tall buildings any time soon, bring on the pie! Just so as you know though, this is a pretty healthy pie as far as pie goes. 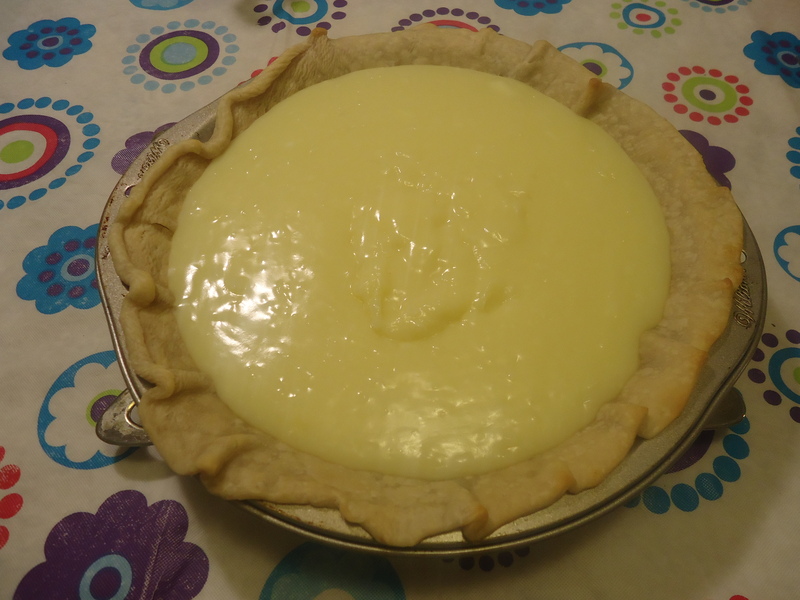 This is an old school recipe, back before pudding was used as a base for cream pies, so you cut back on preservatives by making the pudding base yourself. Also, it has only a small amount of butter, and less than a cup of sugar. If you’ve got a sweet tooth and trying to cut back on the sugar, or if you’re not really a fan of suggery sweets this is the pie for you. 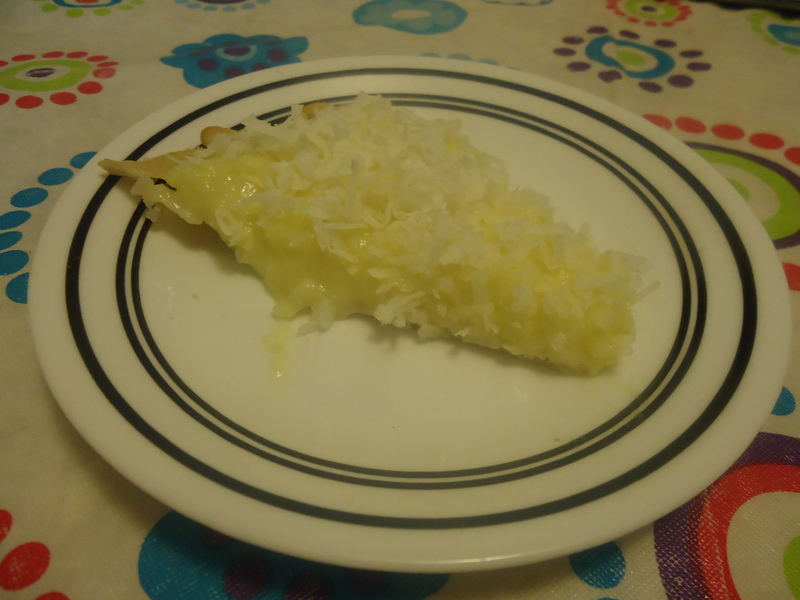 If you want an even healthier pie, or a lighter pie, you can separate out your eggs and use only egg whites, it will make your pie whiter, where this one has a decided yellow tinge, and it might also make it a little firmer, but it won’t affect the taste much. 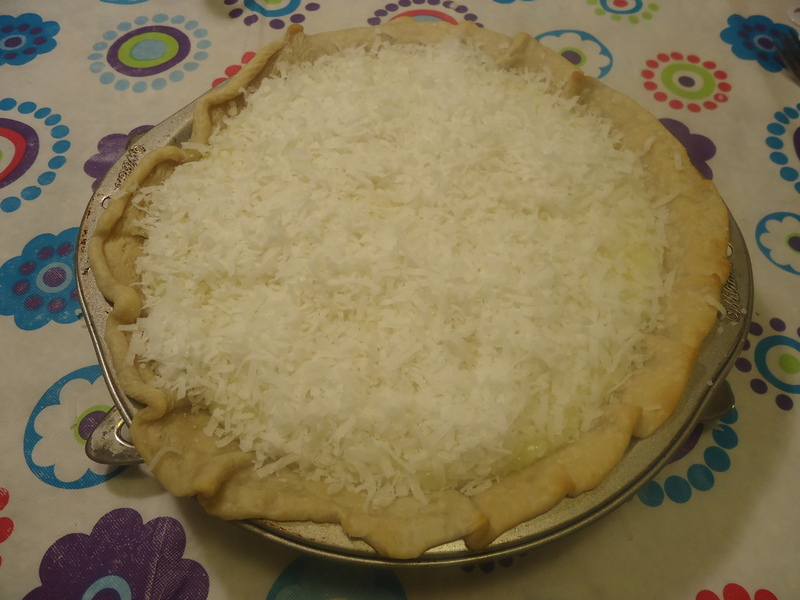 Take the pie crust and carefully unroll it into a pie tin that is dry. Do not butter or oil or flour the pie tin. If you let the pie crust sit at room temperature for 5-10 minutes, this is easier, but it’s not essential if you’re careful. Press the pie crust firmly down into the pie tin, and then pinch the upper crust between the forefingers of both hands in order to create the ‘wrinkle’. Do this all the way around the pie, this will both make the pie have the traditional look, and help prevent it from sinking or burning. Again, make sure the pie crust is pressed down well and is not lower on one area of the pie tin than another. 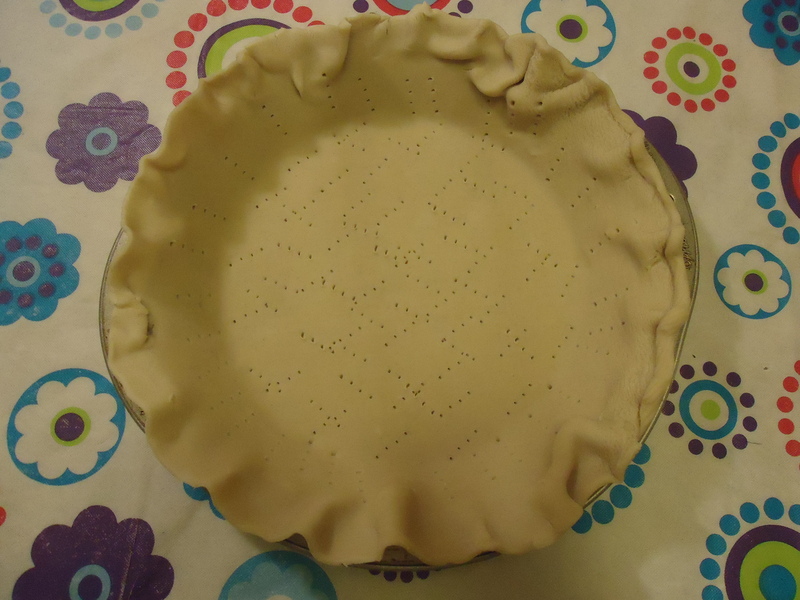 Take a fork and pierce the bottom and sides of the pie crust making sure there are no open space of more than 1 inch. This will let air out of your pie crust while you bake it and prevent it from puffing up. Bake for 10-15 minutes until the pie crust is golden brown. You might want to check it occasionally, and if it starts to puff up anyplace, you might be able to save it by pulling it out of the oven early. 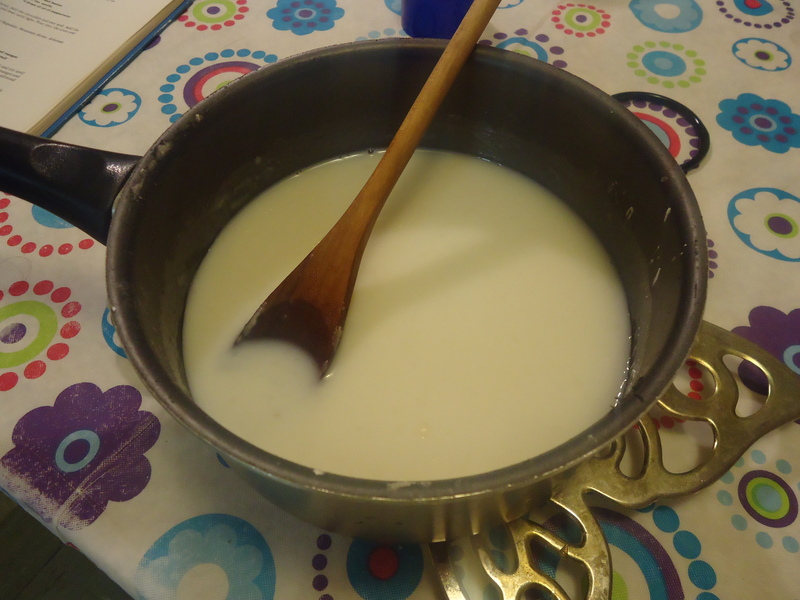 While the pie is baking heat the milk in a saucepan under medium to low heat. Add first the flour, cornstarch, and finally the salt a small amount at a time stirring well after each addition. Make sure you completely blend in each of the dry ingredients into the milk and don’t leave any lumps. Should take around 5-10 minutes, the smaller the measurement of the dry ingredients you try to add at each time the easier it will be to blend. 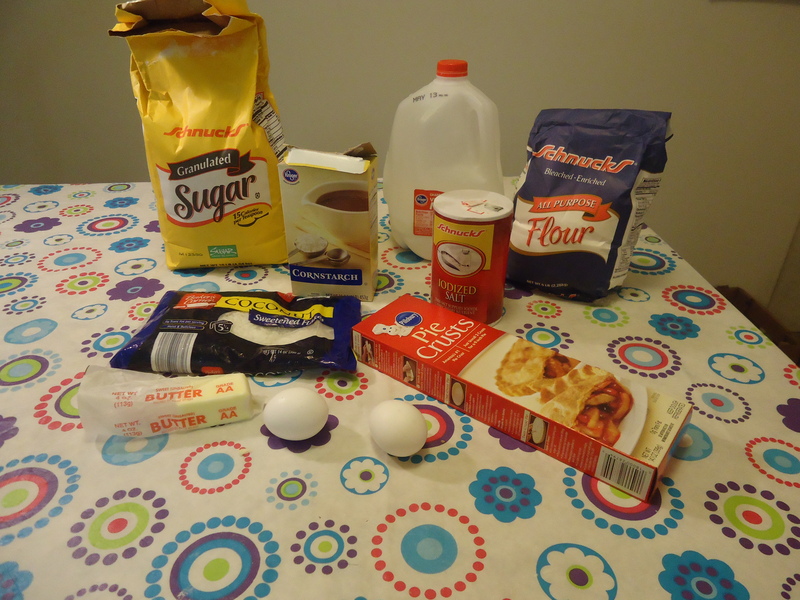 Add the sugar ¼ cups at a time and stir continuously until the mixture starts to thicken. Takes about 5 minutes. Add the eggs, one egg at a time, stirring continuously until the eggs are well blended. Pour into the prepared pie crust. Top with the remaining coconut. Chill overnight. Congratulations, that was it, you’re done! Takes about 20-40 minutes cook time and needs to chill overnight to set up. Since it hasn’t been baked at all, it will only be semi-solid even when it has set overnight, so try not to leave it out of the refrigerator for long.